Get ready for an animal adventure with your little explorer! The Kids' Picture Show books, inspired by the hugely popular YouTube channel, introduce young readers to first words in cool 8-bit style. Get ready for an animal adventure with your little explorer! The Kids' Picture Show books, inspired by the hugely popular YouTube channel, introduce young readers to first words in cool 8-bit style. 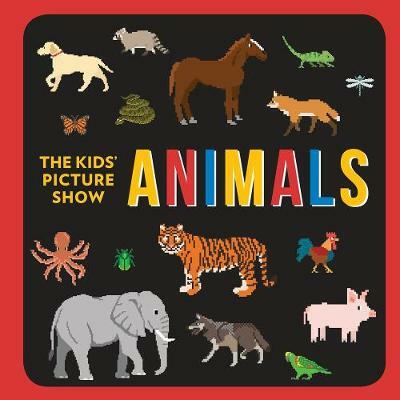 This sturdy board book, packed with images of animals, is the perfect introduction to creatures from around the world for babies and toddlers. The 8-bit illustration style makes the book even more fun and accessible for young children, and will also appeal to parents, grandparents, and everyone who has played classic video arcade games. Chieri DeGregorio has a degree in civil engineering and worked for several years in the heavy construction industry. Steve DeGregorio has taught English as a second language in Japan and the United States, and has also worked in the finance services industry. They live in the Boston area with their two children, and started The Kids' Picture Show in 2013.